I think it was on our Grand Canyon hike that Steve introduced me to the concept of wabi-sabi. If it wasn’t there, it would have been a good place to introduce it. As Steve explained it to me, wabi-sabi is the randomness of nature taking on a spiritual beauty. Looking over the railing at the canyon, one experiences a large eroded plateau, but the beauty is breath-taking. Teddy Roosevelt said that the Grand Canyon is a sight every American should see, and I second that notion. 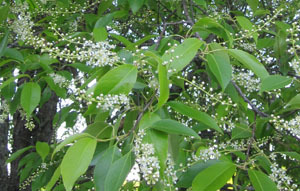 Today on my normal walk with Franco after supper, we came upon a flowering wild chokecherry tree. I happened to glance over at it as we were walking by, and something stopped me dead in my tracks. The clusters of flowers were just beginning to blossom. Some were pointed toward me, some away, some up, down, left, right, but the overall effect of the blossoms, leaves, and branches in the waning sunlight set my poetic soul ablaze. The picture, even in high resolution didn’t capture it, but then I didn’t expect it to. That moment during today’s walk reminded me to keep the radar dish turning. That a wabi-sabi can smack you between the eyes at any time, and that the sensation can be life-altering. This entry was posted on Tuesday, June 18th, 2013 at 9:23 pm and is filed under Uncategorized. You can follow any responses to this entry through the RSS 2.0 feed. You can leave a response, or trackback from your own site.